Make a Set for Yourself and Another to Give! Sometimes simple is perfect, as in these charming coasters. While we’ve seen many coaster designs that are more complex, few are more charming than these are. 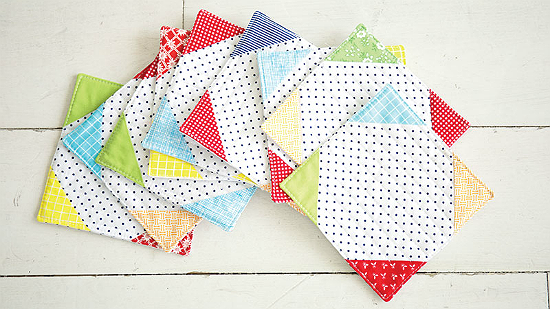 Easy Snowball blocks made from one background fabric plus scraps create the simple yet eye-catching design. 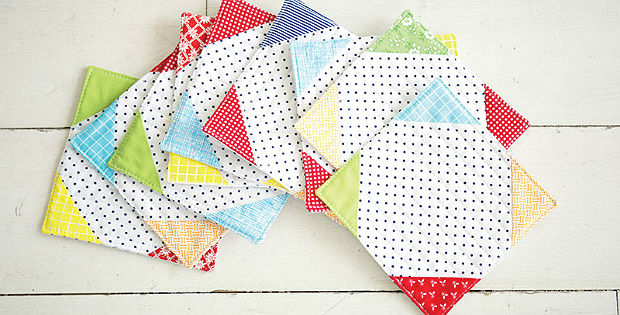 Polka dots in the background help to convey a lighthearted mood while the scraps contribute to a colorful coaster set. These are very easy to make and will go together quickly. Each coaster is 6″ across. The coaster pattern is from The Simple Simon Guide to Patchwork Quilting and was designed by Liz Evans and Elizabeth Evans from Simple Simon & Company. Click here for the free “Snowball Coasters” pattern.